Business Hours- Mon-Fri. 9 a.m-5 p.m.
Fulton Ferry Liquidators is aggressively looking for your excess, obsolete, and competitive buyback merchandise. As more vendors move to increase inventory efficiency, we realize the need for Cost Effective, Low Maintenance Logistics to move your product quickly. We understand that merchandise in your warehouse takes up paid man hours and square footage that could be occupied by new product. 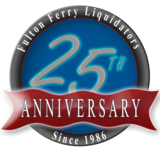 With 25 Years of Experience, Fulton Ferry is here to deliver trusted solutions. No quantity is too small or too large. We are interested in a wide variety of merchandise and are always open to fringe items. Our facility in the Brooklyn Army Terminal is accessible by motor freight, trains and ships. We are capable of receiving merchandise from multiple locations in excess of 2000 unique origins. Our inventory reconciliation process ensures that every piece is accounted for. Give us a call today at 718-499-9696 and get the best for your business. Fulton Ferry Liquidators, 140 58th Street Suite 2B, Brooklyn, NY 11220. Contents ©, Fulton Ferry Liquidators, All Rights Reserved.